Most entrepreneurs will tell you that starting a business is something they always felt destined to do. But a surprising number of ‘accidental’ entrepreneurs, people who never in a million years thought they’d be running their own business, can be found among the ranks of the self-employed. A study of entrepreneurs by The Recruit Venture Group found that a third of business owners never planned on starting their own company. And in spite of the challenges they faced, from raising finance and finding customers to managing with little personal income, only 1% regret their decision, while 12% wish they’d started their business sooner. Ninety per cent say they are happier than when they were employed. The idea of taking control is a big driver for people to work for themselves, while the rising profile of ‘entrepreneurs’ generally has helped more people realise that they can be part of it. 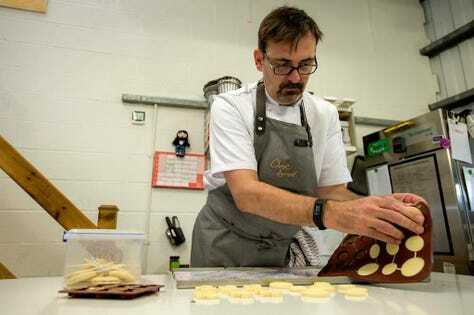 Paul Williams, owner of chocolate manufacturing and retail business Choc Amor, had enjoyed a successful career in finance before redundancy struck in 2011. He spent the following year searching fruitlessly for a job in the same industry, until he spotted a story in the newspaper about someone who became a chocolate maker and decided to have a go himself. After considering several business ideas, his research revealed that the chocolate industry was virtually recession proof, worth £5.2 billion in the UK alone, and offering the best chance of success. After taking a couple of training courses, in 2012 Williams launched Choc Amor. And for Williams, it has. Choc Amor turns over £160,000 ($202,000) annually and has won a string of awards from the likes of Great Taste, the World Chocolate Awards and the Academy of Chocolate. Williams and his wife Jacqui now run the business, producing imaginative flavour combinations, such as orange jalfrezi, salt liquorice, Kalamata olive oil and chilli cappuccino. Each flavour comes with its own ‘How to Eat’ tasting notes. He says he doesn’t miss the world of finance, except perhaps the salary, but has no regrets about becoming an entrepreneur. “We have a much simpler life now, and it only takes me ten minutes to get to work, but the main thing is that I love what I do,” he says. Sometimes a natural break from employment can be the catalyst for people’s entrepreneurial ambitions, as former teacher Temi Kamson discovered. She loved her job and had no plans to give it up, but all that changed when she took maternity leave. Today she runs GT Scholars, a social enterprise offering a range of leadership programmes aimed at helping young people achieve their academic and career aspirations. Kamson had initially planned to do it for a year as a side project, but as the need for these support services became more apparent she felt could make more of an impact through this work than through teaching, and left her job. However, her biggest challenge was making sense of the social enterprise sector. Kamson admits that prior to setting up GT Scholars she knew very little about social entrepreneurship. “Thankfully I discovered very early on that many social entrepreneurs were willing to sit down over a coffee and share their knowledge, insight and experience with me,” she says. Another challenge was the overwhelming sense that her charity’s mission was too big and possibly unrealistic, as her research suggested it would take decades to achieve any major improvement in educational equality and social mobility in England. “I often felt like giving up, but what kept me going was seeing the impact of our programmes, watching young people build their confidence, get better grades at school and move on to achieve their goals in life,” she says.